Follow The Yellow “Bead” Road?? Mardi Gras, which in essence is a celebration of over indulgence prior to beginning the Lenten season was first brought to the United States in the late 17th Century by French Catholic settlers who had claimed the region that now makes up Louisiana, Mississippi, and Alabama! 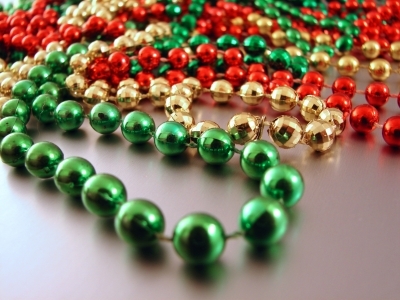 This tradition is celebrated in a variety of different ways around the globe but here in the US and specifically in Southern Louisiana it means nearly 3 straight weeks of parties, balls, eating, drinking, dressing up in costumes, parades, and yes lots and lots of BEADS! Celebrations of Mardi Gras are filled with good times, festive activities, and friendly folks welcoming all to join in on the fun, but none of this can compared to the overwhelming amount of BEADS that you will see! People are wearing them, they are hanging in trees, up in restaurants, and being tossed into the crowds during parades, balls, or even at your downtown happy hours! BEADS may be the single most symbolic things that I have taken away, as a native northerner, experiencing my first true Mardi Gras season! After each parade, which seem to take place almost daily, there are so many leftover beads on the street that you cannot walk down them without risking a tumble and fall over the rounded objects and as cars pass by you hear the snap, crackle and pops of these shiny necklaces being run over. I felt like Dorothy trying to make my way home although instead of a Yellow Brick Road it was a Colorfully Beaded Street. With Mardi Gras season only at its mid point, I am sure there is a lot more for me to see and experience but one thing that is for certain, there will be no shortage of BEADS for me to snag out of the air between now and March 5th. This entry was posted in Education, Travel and tagged Balls, Beads, Bourbon Street, Celebration, Costumes, Dortothy, Lent, Louisiana, Mardi Gras, New Orleans, Parades, Season, Thibodaux, Tradition, Wizard of Oz. Bookmark the permalink. ← Keep Your New Years Resolutions!